At 9:00 am I was surprised to find Axil so quiet. A few tables were empty, though usually there is a wait time. Maybe it was a national sleep in day ! I decided on something different today. 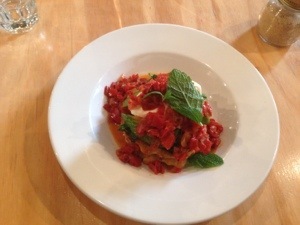 It was the Sweet corn and haloumi fritters. This sounded nice, served with avocado, a poached egg and salsa. Yummy. This was going to be paired with a Guatemalan single origin, latte, which was great. A smooth, nutty coffee, which had a distinct flavor. After yesterday’s Glen Waverly tragedy (I had a late night latte at a coffee joint in Glen Waverly. Didn’t expect much from it though), it was a welcome change. The fritters came out, and it looked and smelled great. Though I was a little surprised at the texture of the fritters. It broke up a little too easily for my liking. Though the taste was nice, and the combination with the avocado and poached egg was beautiful. The poached egg was perfect in its consistency. Overall a nice coffee and breakfast experience. Categories: Breakfast and Coffee Tags: coffee experts, great coffee, single origin. Well, lets be honest, I only came here for the 25% discount from the entertainment guide book. They mentioned on their website that they have started a breakfast menu. Being the breakfast person I am, I thought I would give it a try, located on south bank can’t be that bad right ? WTF ! Seriously. I was waiting outside the restaurant for a table, hoping the waitress would get me a seat. I waited for about 5 minutes as they walked in and out, just looking at me, and probably wanting to know why I’m standing there. Not a word from anyone. Finally the barista told the waitress to get me a table. The waitress sat me down and have me a menu. She walked away without asking whether I would like a drink. Hmm. Annoying. Now I am basically writing all of this while I am waiting to be served. I don’t believe I should raise my hand and say can I please order. If I just wanted to sit down, I would have sat on a park bench. Service is about knowing your surroundings, proactive service, rather than reactive. I’ll be honest, I have travelled to many spots around Melbourne, and even some of the “cheaper” places pay more attention to their customers. Anyway. I have written all of this and now and finally a waitress asks for the order. No, I am not a quick writer. I ordered the Othello Omelette and an orange juice. Regardless of the taste, I won’t be coming back. I’m signing off now. I guess my cheap ways got the better of me. Serves me right for being a tight arse. After the yesterday’s breakfast at Wild Dog Winery, I travelled the other side of the city towards Maribyrnong. Today it was breakfast at The Boathouse. The Boathouse os located right on the Maribyrnong river, and has a really nice setting around it. Lots of parkland, the boat club in the area, plenty of people kayaking along the river, and plenty of people running along the river in an effort to get fit. Today, my aim, though not to gain weight, was definitely not to lose any ! I was seated at a table near the counter, and ordered the Vegetarian breakfast and a latte. This was in stark contrast to yesterday’s breakfast, which was basically 2 small poached eggs on a couple of pieces of toast. This was more substantial. The atmosphere was quite good, with a family friendly feel to the restaurant. The breakfast itself was quite standard, nothing out of the ordinary, though the surroundings were quite relaxing, and overall was a good dining experience, even for breakfast. Don’t get me wrong, it wasn’t like it was a bad breakfast. It was good, but nothing really spectacular. I would recommend this place, not only for its food, but more so for the surroundings, along the river, a good buzz around the place. Today I had planned to join Richard, and old colleague and friend, at Wild Dog Winery, located in Warragul. It was actually a good drive out. Nice and relaxing. It was a shorter drive than I expected though. Listening to Whitney Houston on the way, I couldn’t complain. I arrived at Wild dog, with not a car in the ca park. I was a little worried, as I had book over the internet, for 2 people, and with bookings over the net, it is always a fear that the restaurant is not open at the time. Though this was not the case. We walked in, and the helpful waitress gave us a table with a view. Fantastic view, looking over the winery and the farm. We were the only 2 people in the restaurant. The breakfast menu was a little light compared to others, though, I can imagine that in a far away place, it would be rather difficult to maintain a long breakfast menu. I ordered poached eggs on toast, and Richard ended up ordering a full breakfast (I am not sure what they call this). A breakfast with the lot. 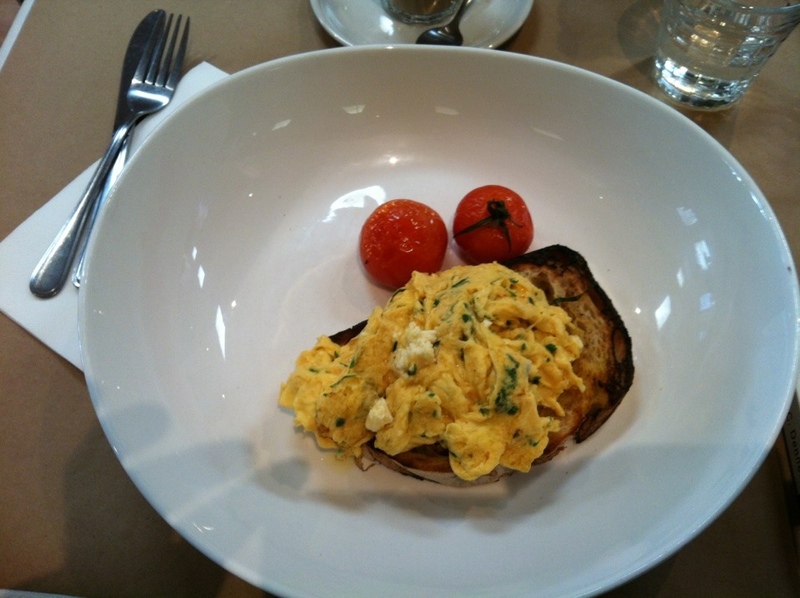 The breakfast was ok, not a great standard, but really wasn’t expecting too much. It seemed more of a dinner place than a breakfast spot. To catch up with Richard was good. The view was fantastic, and it felt to get away from the hustle and bustle of the city. 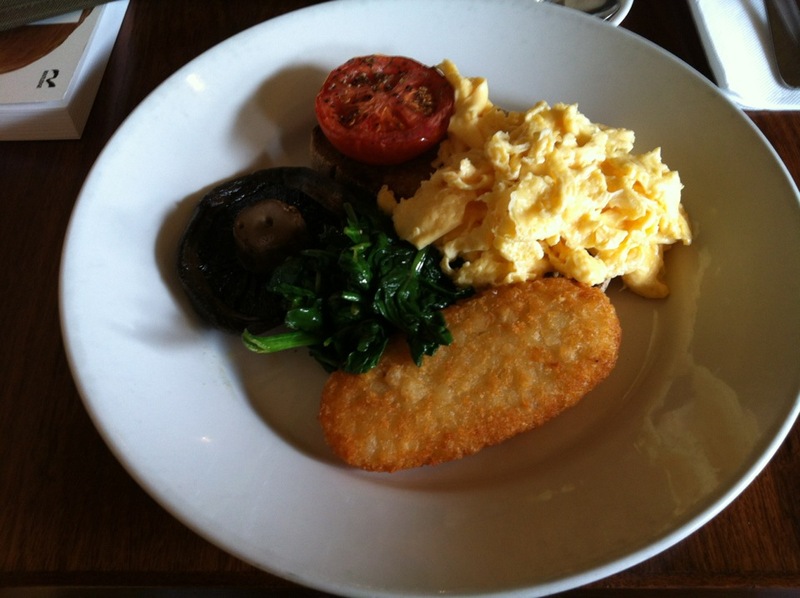 It’s been a while since I have written something, but I have not stopped going to breakfast spots around Melbourne, just have been lazy updating my blog. I did make it to Bistro Flor a couple of weeks ago, and sort of had some low expectations going in. Its a small cosy spot, situated on a corner. It wasn’t busy this particular morning, and only a couple of people were in. The waiter was friendly, and offered me a seat away from the cold door entry. I ordered the standard latte, and something totally different for my breakfast. 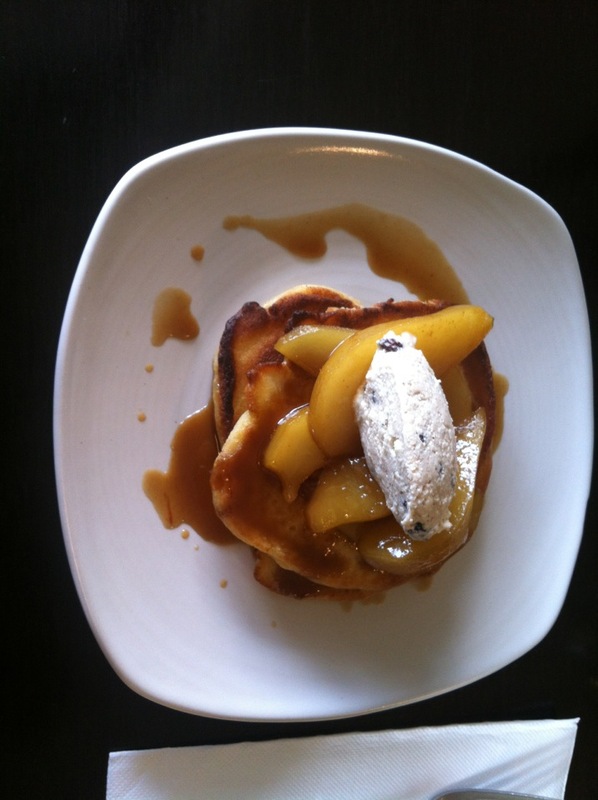 I went away from the egg choice, and decided on Ricotta Hotcakes with poached pears ! Poached pears you ask ? What is going on ? Actually, it was one of the best breakfast I have had. It was fresh, tasty, and, well fantastic. Really was good. I am now afraid to try another hotcake experience, incase I ruin the experience. I am going to definitely going to try this again. It will be worth another trip. Another chilli Melbourne morning. Not as bad as the previous morning, were the fog had taken almost all day to lift, and even when we played golf, I don’t it lifted at all. I joined one of my work colleagues for a coffee in the morning, and as I had the day off, I decided on having another breakfast from a page in the Age Good Food guide. Syracuse it was. I had planned to go there before, but got sidetracked, though not today. After a coffee at 65 Degrees with my colleague / friend (a conversation about golf, work and photography), I made the cold walk towards Syracuse, located in the banking district of Melbourne. (to eat at some of these places, you need to rob a bank, so actually was in a good spot), Traditionally though, breakfast at most spots are rather standard in cost. Even Circa the Prince was only $22.50 for a breakfast and coffee, which wasn’t too bad. Upon entering Syracuse, my frozen hands and face were glad to be in a warmer environment, and immediately started to thaw. Syracuse has a very traditional place. Spacious, comfortable seating, rather seemed like a relaxing place to be. Though I am aware that in the evening, I would imagine that the town’s high flyers would be dining there. Today though, it was poor me. ! 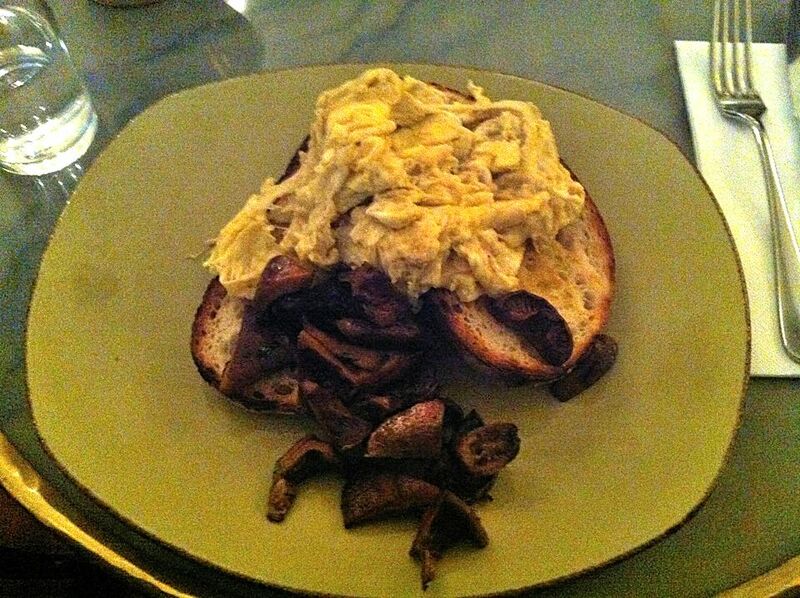 I ordered scrambled eggs with a side of mushrooms. Nothing special really, tasted pretty good, was made fresh, and really couldn’t spot much wrong with it. I have to admit, I was expecting more of a treat, like Circa, or Cumulus, where they have these delightful baked egg dishes. It was a good breakfast though, and I couldn’t complain. The service was as expected, nothing really pushy, but good, genuine service. Maybe I might make the trip in an evening one day to really enjoy the delights of Syracuse.